I do not like ribs – so we invited over a guest and along with Jim the ribs were finished off and appreciated by those who enjoy the meat on the bone. Preheat oven to 350 degrees-F. Trim off and discard excess fat from ribs. Place in a cookie sheet with sides and coat with 1/2 cup of Barbecue Sauce. Cover ribs with aluminum foil and roast for 45 minutes. Remove from oven, discard foil, and baste with an additional 1/2 cup of Barbecue Sauce. Return to oven for 30 minutes. Meat should be tender when pierced with a fork. Bake for additional time if needed, checking every 10 minutes. Warm remaining 1 cup of Barbecue Sauce over the stove. 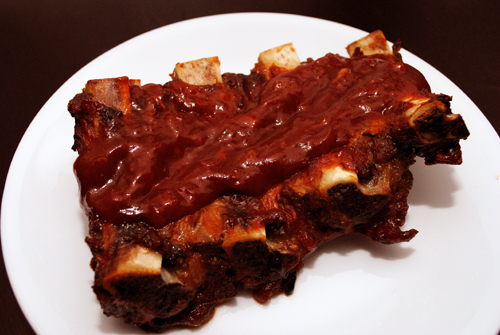 Serve ribs with side dish of Barbecue Sauce.